Designing and creativity is your thing and keeping it unique is your style then I have something for you that will help in getting the best of artwork and design on work pieces. Introducing to my readers Wen 3920 16 inch scroll saw.In this saw machine, blade holder is designed to hold half pinned and pin less blades. This is gonna help get grip no matter how many times you change the direction in itching the designs. Wen 3920 16 inch scroll saw is easy to use and gets you the precise precision in designs. The product is perfect for the artworks that requires intricate detailing. As some customers have said, saw starts to vibrate after it crosses certain speed limit. The blades have said to have slipped from the holder, according to the reviews. Needless to mentioned, it is a machine and wear and tear leads to decreasing performance. There may be, sometimes, running to your nearest repair shop if the product is not kept well and in good place. Product specification and description will give a better insight into the product. Go through it with ease and attention and do not miss out on details. I am sure you are smart. Good Luck! The product has a unique design with full safety and allows blades in two different directions. Speed limit is 400 to 1600 strokes in one minute. Includes a cast iron base, air pump, flex light, dust port, foot lock clamp, onboard storage and blades. There is 16 by 11 inches table that can bevel to 45 degrees in left direction for the perfect and desired angle cuts. It comes in attractive black and orange combination. Production dimension is 24 x 11 x 13 inches. 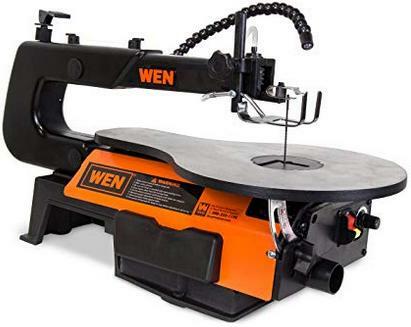 Wen Scroll Saw has the especially designed table that can be used easily for making different designs and it has a 16 inch depth which is going to help you cut down thick base. It may be so that you require both above kinds of blades for different designs in mind. Wen 3920 16 inch scroll saw can work wonder with both. Wen 3920 16 inch scroll saw understands that light is important for crafting to go perfectly well. Hence, there is flexible LED light. Intricate designs could be difficult and the process needs stability for which there is hold-down Clamp. It’s a foot lock clamp that gives stability and prevents sudden shaking and displacement of work piece. To use the pinned blade all you have got to do is pop the pin in the front holder and rotate by 90 degrees. This will help in making design that will be more than the 16 inch capacity of the saw. Saw has removable pin less blade holder which is very helpful as it will help the two blades from colliding and creating friction and also coming out loose while you work on your masterpiece. Speed becomes fundamental to the right design in your head. The speed range of product is 550 to 1600 strokes per minute. To adjust the speed just get hold of the knob in front and regulate the speed as per need. It’s a strong and technically advanced machine which is going to easily cut and slice 1.9 inches thick of wood. Tension and friction often makes a machine weary. Hence, it starts to malfunction. But with Wen 3920 16 inch scroll saw there is no such complication, friends. Tension release switch is there which also enables blade changing. Air pumps makes sure your designs don’t get interrupted in the process as it clears away dust from all that design making. Hope the above mentioned points will help you to use this machine and get best results out of it. To make things easier for my readers, I have listed out some more important stuff related to product. This was all about it. Hope you are soon getting Wen 3920 16 inch scroll saw for yourself and be the artist you are. Please feel free to use the comment section below to tell us more. Till then, thank you and good luck!